I have always been of the belief that are two types of people in the world. There are those whom, while they may be good looking, open their mouths and become uglier with each word they speak; and then there are those who, while not blessed with the best of features, grow more beautiful with every word, or gesture, that they make. Amelia Earhart was one of the latter. She meets George Putnam, the publisher, when she applies to fly the Atlantic solo in 1928, just one year after Lindbergh made the first sucessful crossing. When it turns out that she is really to be only a figurehead, with two men doing the flying, she initially refuses. 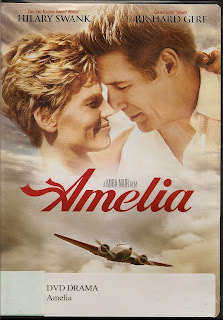 George Putnam explains that this is something they must do in order to achieve the goal, as the woman who is financing the mission will not do so if Amelia flies alone. Faced with the alternative, Amelia gives in. But that's the first, and last time in which she bows to the wishes of others concerning her own career. Way ahead of her time in science and adventure, Ms. Earhart was also way ahead of most women when it came to traditional relationships, eschewing marriage as a cage. But that is a cage to which she eventually succumbs, when she weds George Putnam. But even in that endeavor, she does it her way, refusing to repeat "obey" in the marriage vows. For his part, George Putnam is unconcerned with this. He doesn't want a caged bird, just one that will always fly back to him. After winning more contests of speed and distance, opening up new avenues for women in a field that was barely 30 years old, Ms. Earhart finally sets out to conquer her dream - flying around the world. To that end she takes her navigator, Fred Noonan, on her final fateful flight. She has had trouble with him before. In her last communication with her husband, she intimates that Noonan is drinking again. She also tells her husband that this is her last flight. She wants to come home and stay with him. She never makes it. Theories have ranged for years concerning her disappearance somewhere in the Pacific. One of the most prevalent theories is that her final flight was really a cover for U.S. Naval Operations in the Pacific, where the Japanese were beginning to expand their empire in search of the raw goods which were denied to her by an International Embargo. This has never been proven. As in many good films, a few facts were fudged to make it work, but overall this film is beautifully filmed, acted, scored and a pleasure to watch. It will turn, on it's head, all that you ever thought you knew about this beautiful and gifted woman.